THE TONTO KID (1934, Resolute) Rex Bell, Ruth Mix, Buzz Barton, Theodore Lorch. Along with Gunfire, this is one of Bell’s best westerns. A shyster lawyer induces a lady circus rider to impersonate the heiress to a ranch. She takes Rex into confidence when a vein of platinum is discovered on a remote area of the ranch known as “the devil’s pocket.” She and Rex plot against the lawyer, who is planning to kidnap the real heiress. A great script and fine performances. From 16mm. 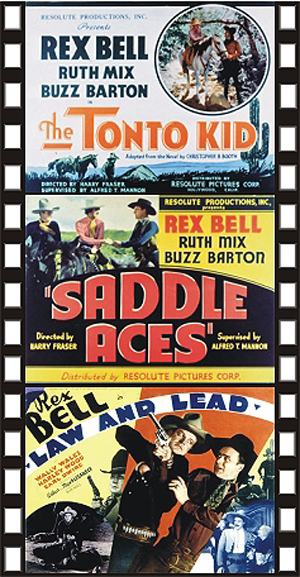 SADDLE ACES (1936, Resolute) Rex Bell, Ruth Mix, Buzz Barton, Roger Williams. A convicted murderer and a safecracker pull off a daring escape while handcuffed together, riding on a train. They later show up at a ranch and help a young heroine from being swindled by a large cattle company. From 16mm. LAW AND LEAD (1936, Colony) Rex Bell, Harley Wood, Lane Chandler, Wally Wales. Rex is stunned to hear rumors that his amigo, the Juarez Kid, has gone bad. Has the Kid really turned bad again? Rex rides out to find the truth, but his life isn’t worth a plugged nickel when he learns too much. 35mm. WEST OF NEVADA (1936, Colony) Rex Bell, Joan Barclay, Al St. John, Forrest Taylor. Rex is the rough-riding son of a U.S. Senator who comes out west to protect the gold mining interests of a local Indian tribe. Taylor is the slick gangster who tries to capture the gold for himself. This beautiful 16mm print features some of the most stunning Lone Pine photography ever shot. Recommended.